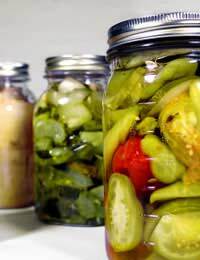 Home > Ask Our Experts > How Do I Ensure Jars are Sealed Properly? I have just bottled some pears and apples in the glass jars with glass tops and rubber rings (my first time I might add) in an electric steriliser machine, how do I know if they have sealed properly, they are still warm and the fruit seems to be towards the top of the jars? It is important to sterilise jars, so that bacteria doesn’t have a chance to form on the surface of the jam, causing it to go mouldy. By sterilising the jars beforehand you should avoid this. One method you can try is checking the seals on the top of the jar by turning them upside down. Obviously, if there are any leaks, they’ll become apparent quite fast! This should let you know whether the jam jars have sealed themselves properly. Hot air expands and rises – this is most likely why all the fruit sits at the top of the jar shortly after being bottled. But as the hot air inside the jar cools, the air contracts and draws in the lid and seal, effectively creating a vacuum. During cooling you’ll probably notice that the fruit begins to settle as the liquid cools. The vacuum created by the cooling air firmly closes the lid down. A vacuum means that no air can escape and no air can get in. And as the jar has been sterilised, there is no bacteria that can grow within this airtight space. Jars with metal lids have a small ‘button’ that is drawn inwards as the vacuum is created – a useful visual aid to show that the jar has sealed. If this button has popped, the jam jar either has a leak or the jar has been opened. You’ll often see supermarket jams with these pop buttons. But with glass-lidded jars with rubber seals, of course there’s not a visual ‘thumbs up’ that everything has sealed properly. So in this case, as aforementioned, the best thing to do is very simple. By turning the jar upside down you’ll not only check for leaks, but this is also a great way to store your bottled fruit. By creating a vacuum at the bottom of the jar when stored upside down, there is a much better chance that there will be no gaps or leaks for air to get in. Obviously, this means that no mould will form on the surface of the preserved apples and pears and is a sort of “two pronged attack” on ensuring that the jars are sealed properly. This can happen if you do not fill the jam to the top of the jar, when filling. The fact there is a gap between the jam and the lid means the food has room to breathe and therefore expand when the jam cools. It is not a problem if the jam is eaten relatively soon. However, the extra gap does mean the jam may mould if stored for too long.